Could it be any tighter at the bottom? With 12 game weeks to go, just seven points separate bottom of the league from 11th place. The title race might be a foregone conclusion - whisper it... - but the battle to avoid the drop looks destined to go right to the wire. And with that, it's time to wrap this up. Don't forget you can follow the action from the Emirates, where Arsenal lead Everton 3-0, right here and on BBC Radio 5 live. Then tune in for some cracking goals on Match of the Day tonight. Bournemouth manager Eddie Howe: "The two subs made a difference and it shows the quality in the squad. A goal's been coming for Lys (Mousset), he's a potential match-winner so I'm really pleased he got his first goal. He and Josh King did well. They're talented players and are an important part of our future. "The injury to our centre-half meant a change of system to make sure it wouldn't hurt us. We kept tweaking things during the game and it worked in the end. "After the energy expended at Chelsea, it was pleasing for the players to go again and come back in the second half." Riyad Mahrez was absent for Leicester's 1-1 draw with Swansea, but Claude Puel says he's not thinking about the want-away winger. "I just need to think about the players available," he said. "I know in my mind the most important thing is just to consider my team. "I am disappointed about it all." Despite the defeat for Stoke, new signing Badou Ndiaye had a pretty impressive debut and created the first goal. "We were really good in the first half, we looked threatening," said boss Paul Lambert. "And Badou coming in was excellent. "It's his first game in a fortnight, he's only trained once, but he managed 70 minutes and I'm delighted with his contribution. His performance was first class and he put in a terrific cross for the goal." On Stoke's survival hopes: "I'm still encouraged, that's the plus. We've got more than enough in our make-up to win games and the way we've been playing in my first three games, I'm really happy." Stoke manager Paul Lambert speaking to Match of the Day: "There's no way we deserved to lose that. We looked so comfortable I would have been disappointed to draw, let alone lose. "I can understand the first goal, they had a bit of luck on the break with it coming off Joe (Allen). "But there's no excuses for the second goal, it was unacceptable. It was really poor marking and if you don't defend set-plays you're in trouble." More from Brunt, on the tributes to Cyrille Regis at the Hawthorns: "Before the game, warming up, we could see what was going on in the background. "It's a pity we couldn’t get the result to match it and make the big man proud. "It's been a tough week for everyone at the club and such an unexpected thing to lose Cyrille. "For the football club he's an icon." West Brom's Chris Brunt speaking to Match of the Day: "It's a big blow, we started the game OK but to be fair to Southampton they played really well and controlled the game and we had too much to do. "You can't concede three home goals and expect to win - it's one more game down and one more lost for us. "They took the sting out of the game and overall if we’d come away with a draw we would have been happy with that the way we performed in the first half. "We lost that today but there are plenty of teams around us and we're only a couple of games away from getting ourselves back up there." More from Mauricio Pellegrino: "I am really happy for the team because all of us have been working very hard for lots of months and lots of weeks. It's very hard to beat any opponents in the Premier League but today we are happy. "The position in the table is nothing because we want to go higher and move and get more points and finish high as possible. We win an important game today but have to continue. "This was a really nice game, up and down pitch, both wanted to win from beginning to end with a lot of chances." Huddersfield are the 20th consecutive team to lose their first Premier League visit to Old Trafford, since Derby County won there 3-2 in 1996-97. Southampton manager Mauricio Pellegrino speaking to Match of the Day: "We needed this victory, for many reasons, but most important one is to believe what we can do on the pitch. "We are happy with that today, the Premier League is tough every game, every week and everything can change. Now we celebrate this and it will be massive to increase our confidence. "It wasn’t easy, they scored really quick but we played with personality, played the ball on the ground and finding space between the lines. "When we went in front we had many chances to score more goals and they're really strong on set-plays so we struggled a bit later on." Jose Mourinho has just confirmed Marouane Fellaini had a knee operation this morning. He said he expects Fellaini to be out until the end of March. Here's Leicester manager Carlos Puel: "I'm frustrated. It was a a good game against a tough team and they defended very well. "We had to score more in the first half. I don't think it is a fair result and we have lost two points. "Congratulations to Swansea, but we deserved to win. "It was a difficult second half and Swansea played well and with quality. We finished strong but we didn’t get the result in the end. It's always a big disappointment because we felt we lost two points." Alan Pardew on giving Daniel Sturridge his first West Brom start since arriving from Liverpool on loan: "It was a tough call, Jay (Rodriguez) has done really well recently but he's had two tough stints against Liverpool and Man City which were two tough games for us. "I thought it best to bring Jay on later and play Daniel, who's fresh. "We’ve seen enough in training and bits today, he wasn't quite on it today and if we had everyone available he may not have started, but it was a juggling act with the players today." 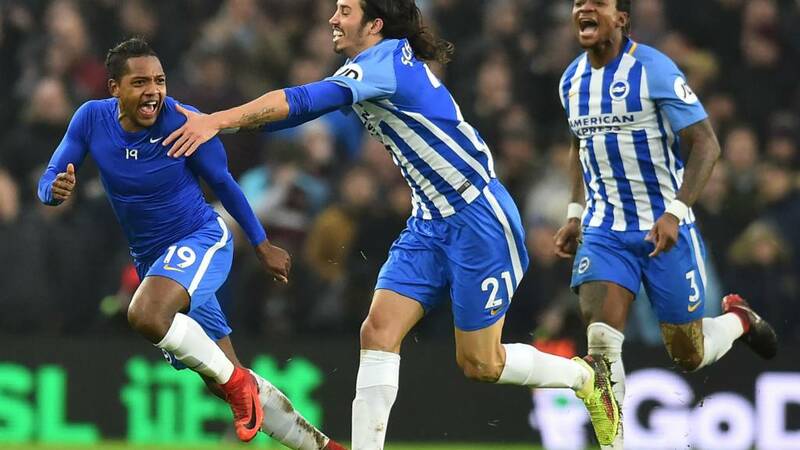 We've been talking about that Jose Izquierdo stunner for Brighton against West Ham. Top bins. Postage stamp. Worldie. Whatever you want to call it, Hammers stopper Adrian had no chance. West Brom manager Alan Pardew speaking to Match of the Day: "It's a painful one for us because Southampton looked like they had a little more energy and fresher players in the middle which showed. We had players who had been playing two games in three days and looked a little leggy and it was unlike us to concede through two set-plays. "It was a shame because it was a special day in a lot of ways but not a special result and no matter how much we huffed and puffed we just couldn’t get back into it. "Our fans will want to see something from us, we have a tough game against Chelsea and then a run of games where we have a chance to correct our position." West Ham boss David Moyes, speaking to BBC Sport: "We've been on a good run recently and stuck at games but we weren't really at the pitch of this game from the off. "It was a world-class second goal and very difficult to stop. "We grew into the game and started to make one or two chances. But we expected to grow into it more in the second half but we didn't. "It showed that we had to field the same team again as midweek but Brighton played in midweek so it's no excuse for us. "I'm a little bit frustrated by the transfer window - we needed a third player but didn't get that at the end. So I'm OK with bits of it, disappointed with other bits." More from Terriers boss David Wagner: "We tried to make tight spaces, we wanted to make it uncomfortable and give battles all over the grass, the players have done that but we saw the quality of Manchester United. "Usually goals conceded are after mistakes, today we know who made the mistakes but we lose as a team. there is no point pointing out individuals. "They have top, top quality and they were patient enough to wait for the moment. They created the few chances which they needed and used one. We were not able to go in front and that is why we deserve the defeat." Swansea manager Carlos Carvalhal talking to Match of the Day: "I am happy with one point. We have lost the last seven here. "We had a bad first half and after we corrected things. We did much better in the second half. "We were planning to give more pace in attack with Bony, but the last 10 minutes Leicester were more organised in attack, and created more noise. "We are happy with the draw and it was a difficult game." Huddersfield Town manager David Wagner tells Match of the Day: "It was a fair result, the better team won. We made it uncomfortable for them, we wanted to work and fight and stay together, that is what the players have done for a long period, but they used one of their chances and it was a deserved result. "I have seen what I wanted to see, we will not have much of the ball and not create much chances, so I can live with what I have seen with the commitment and effort from the players. if we play like this, then I am sure we will see the results."